This traditional Karakachan breed of sheep was once plentiful in Bulgaria; in the early 20th century there were 500,000. By the late 1950s, when farms were nationalized, the number had shrunk to 160,000. Today there are approximately just 400. The sheep are small, about 57 cm at the withers, with short, thin tails. 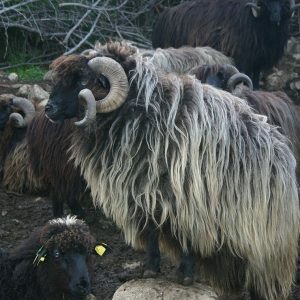 Their wool is coarse and long – up to 40 cm and its color changes with age: when young, the sheep have black wool, which then turns brown and ends up almost grey. In 1992, Sider and Atila Sedefchev from SEMPERVIVA – a Bulgarian nature protection organization that specializes in the conservation of endangered local breeds – started a project to save the Karakachan dog breed. The dog is one of the oldest breeds in Europe, used to protect livestock – mainly sheep – from wolves and bears in the high mountains. While searching for these dogs, the sheep were discovered, along with a traditional breed of Karakachan horses. These horses are used as workhorses, mainly to carry baggage on the dangerously narrow and high rocky paths. 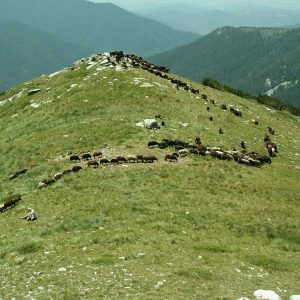 The Karakachans, Balkan nomadic people who were livestock breeders, are thought to be descendants of the ancient Thracian livestock-breeding communities located in the high mountains of Bulgaria. Each sheep produces about 50-60 liters of milk per season. The milk is very rich (with a fat content of 6.5 to 8%) and high quality. About 20 kilos of white cheese, called sirene, are made each day (approximately 400 kilos each year). Yogurt, which originated in Bulgaria, is also made daily. The sheep are milked twice a day. The milk is immediately filtered through a cloth before the rennet is added. A lid is then placed on the container for about two-and-a-half hours as the curd forms. Next, it is cut with a knife and left for another half an hour. The young cheese is then put in a special fabric and placed in a small cloth-lined wooden crate made from the wood of the native Macedonian Pine. The cheese is covered with the fabric and the lid put on the crate, secured by heavy stones placed on top. The cheese is then left to dry for four to eight hours, depending on the weather. When dry, the cheese is firm to the touch. It is cut into tile-sized pieces (about 12 cm), salted with large-grained sea salt and stacked in large tins or plastic barrels, which are closed with a lid. The brine forms and over the coming days the barrel is opened and topped up with whey mixed with salt. The method of making traditional Bulgarian yogurt (called Kiselo mleko) is much simpler: fresh milk is boiled and left to cool to room temperature before Lactobacillus bulgaricus is added. At the beginning of 2000, the Semperviva Association opened a farm as a project to recover the Karakachan animal breed. Today the farm is self-financed. There are 700 Karakachan sheep, 30 Karakachan horses and 45 Karakachan dogs. The objective of the Presidium is to bring attention to and preserve this traditional breed of sheep. There are only a small number left since they have been crossed with other breeds. 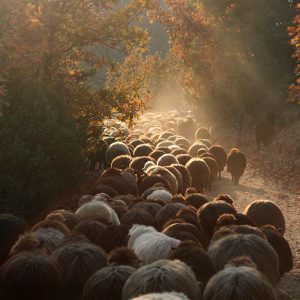 The producers have worked for more than 10 years to find pure breeds; searching remote mountainous areas where some shepherds live and have kept their flocks separate from others. The aim of the Presidium is to revive the breeding of this heritage sheep breed and to promote the products obtained by Karakachan sheep’s milk: white cheese and yogurt. Nowadays the majority of shops and restaurants in Bulgaria sell industrial cheeses and dairy products, while the hand-made products are neither appreciated nor valued. Therefore necessary to work to promote them and to build a taste consciousness. What’s more, the Slow Food Foundation has, together with the Sempreviva association, helped the producers to restore a dairy which had destroyed by fire in 2012, and a build a new ageing facility.